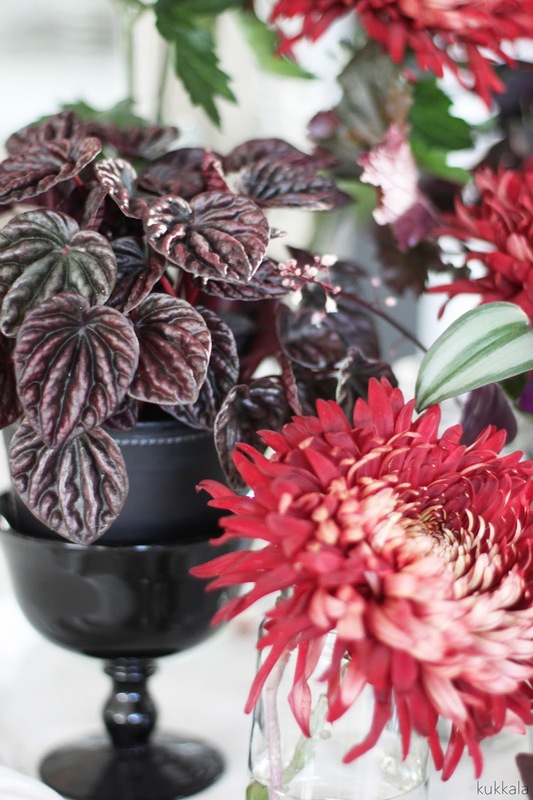 This blog post is my very first for Urban Jungle Bloggers, which is a fresh initiative resulted from two bloggers' passion for plants. 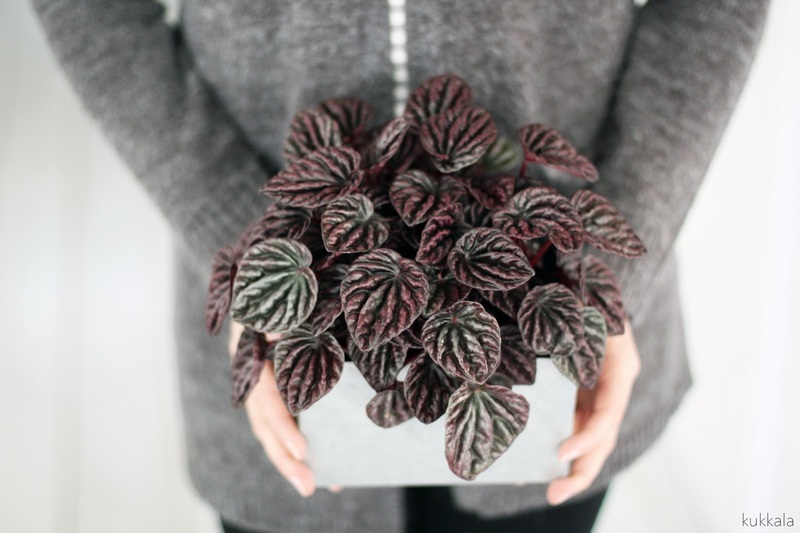 Bloggers interested in indoor plants - around the world - are invited to join in. 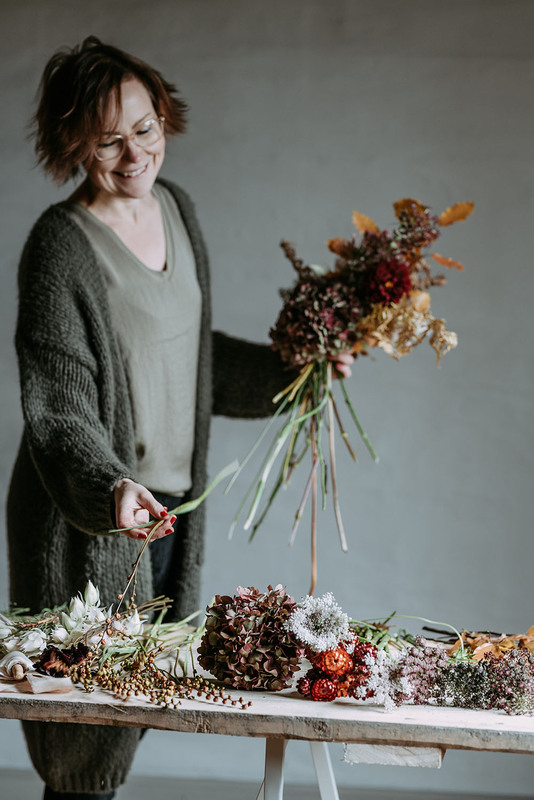 Every month Igor Josifovic (Happy Interior Blog) and Judith de Graaff (JOELIX.com) select a green topic and invite the bloggers to make their own vision of green living and interiors. Sounds fun? I'm a huge fan of non-green coloured plants f.ex. 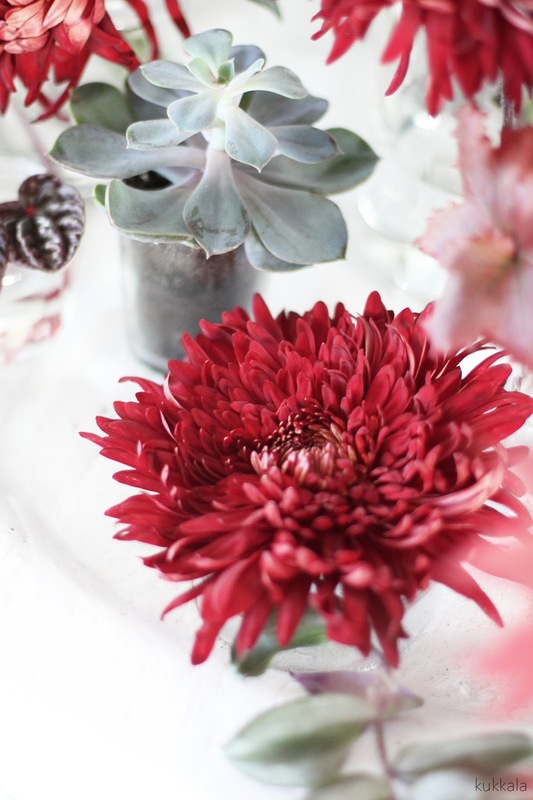 silver and red, both indoor and outdoor. 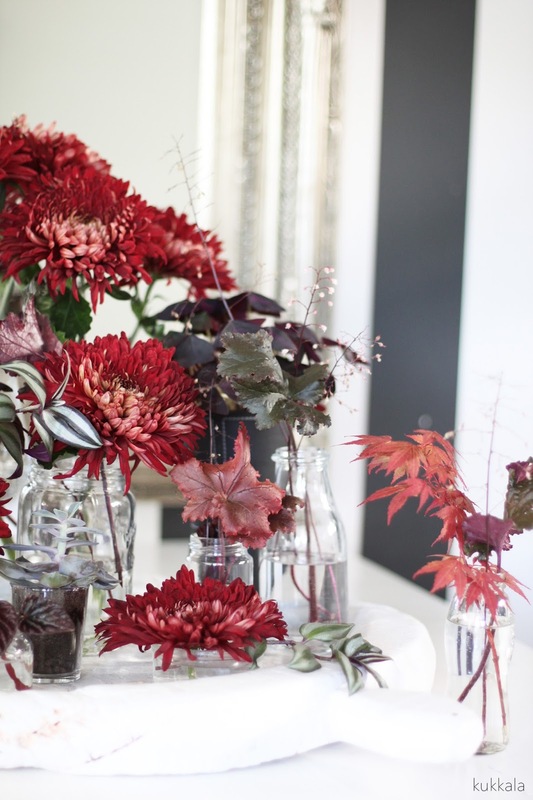 Colour of the year 2015 - earthy wine red marsala - is a colour definitely for the autumn season. 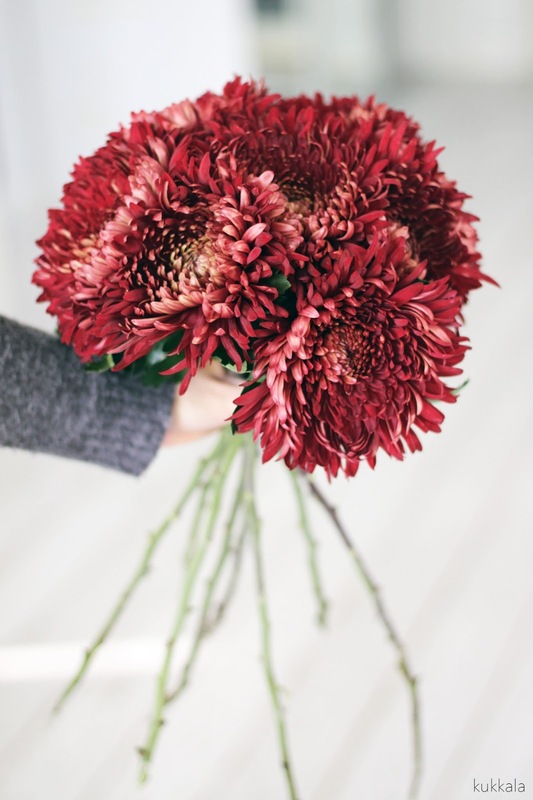 These in mind, I collected some plants with red colour from my home; peperomia (Peperomia caperata), oxalis (Oxalis triangularis) and wandering jew (Tradescantia zebrina) and bought some perfect marsala coloured chrysanthemums. 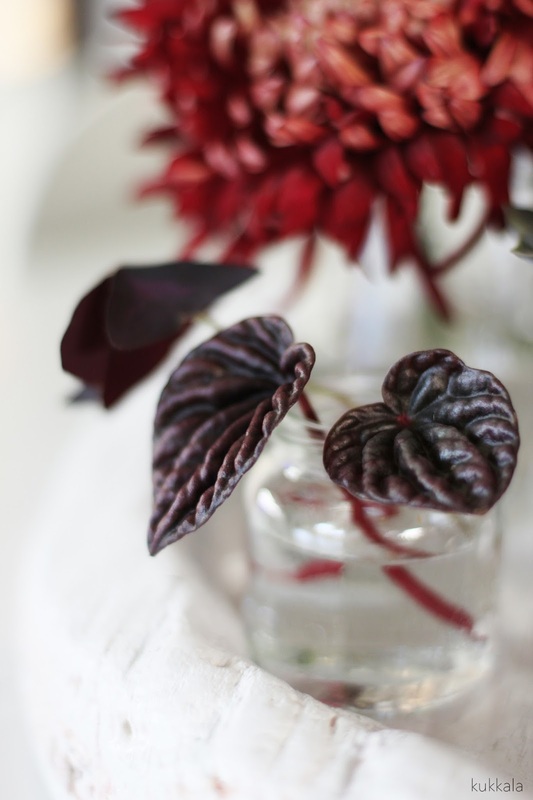 And to add even more red, I picked some heuchera foliage from my garden. 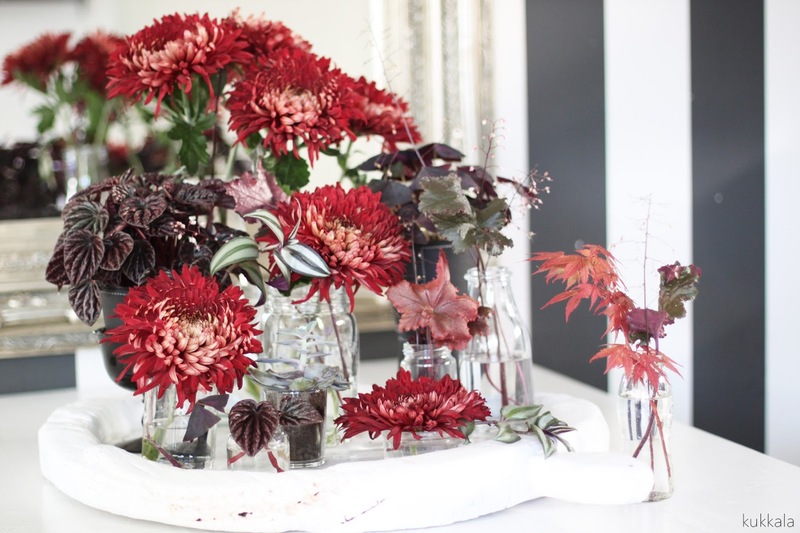 I selected a lovely white wooden tray where I arranged some bottles and vases, and plonked the chrysanthemum stems and heucheras and their flowers in them. Then I added the plants and some indoor plants' foliage in. These UJB posts will be in English, and from now on, my regular Finnish posts include a short English summary. 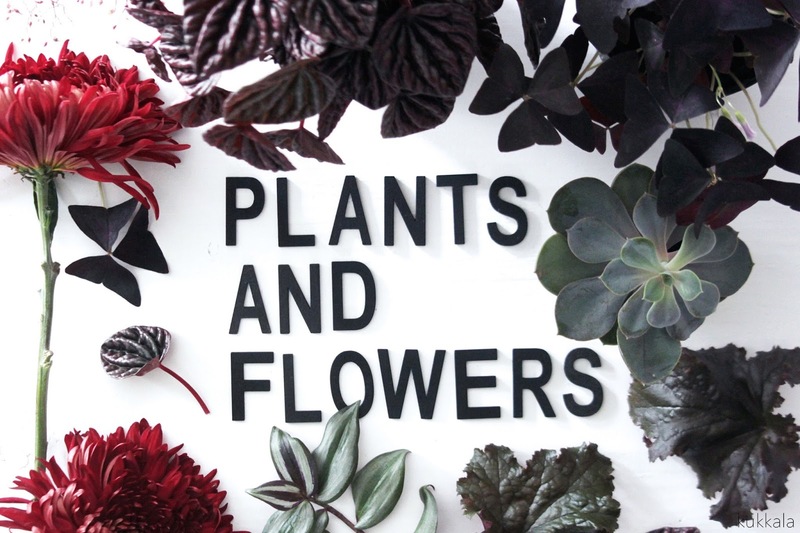 "Urban Jungle Bloggers is all about living with plants – in your home, in other interiors, in public spaces. 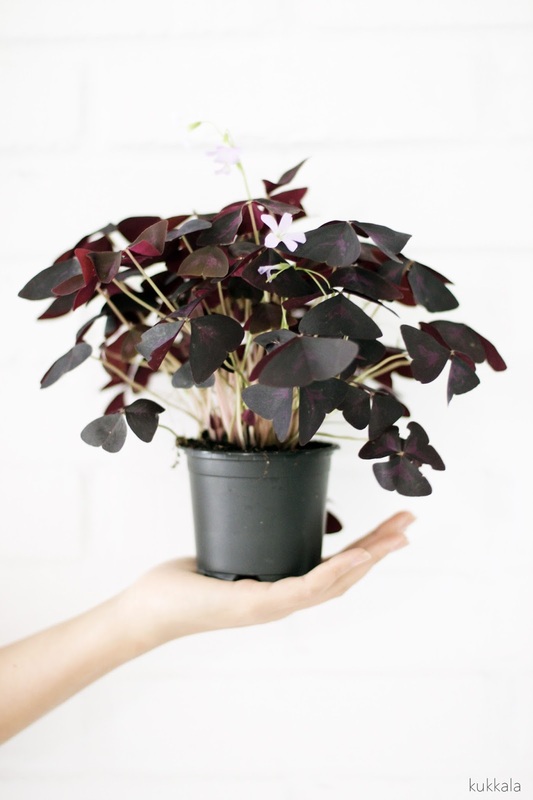 We want to highlight the beauty and benefits of houseplants and other greeneries in urban spaces. 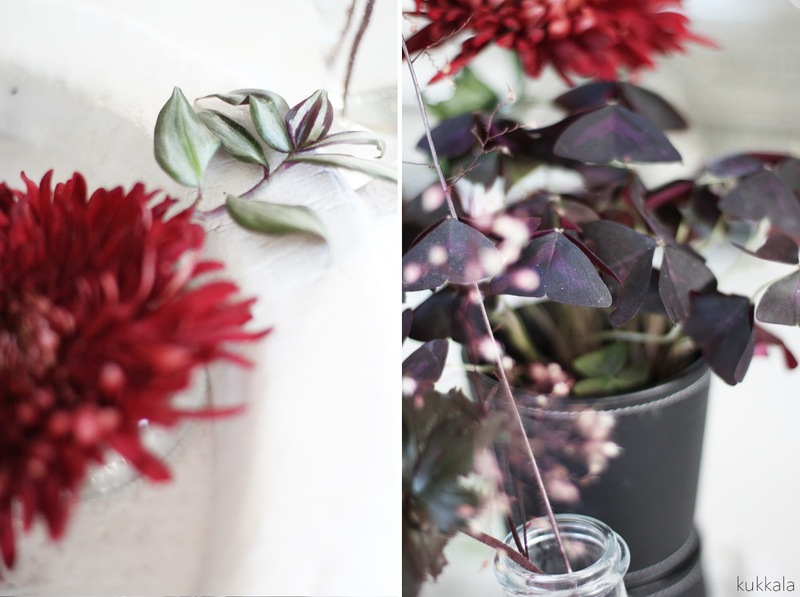 Living with plants is not merely about styling and decorating. 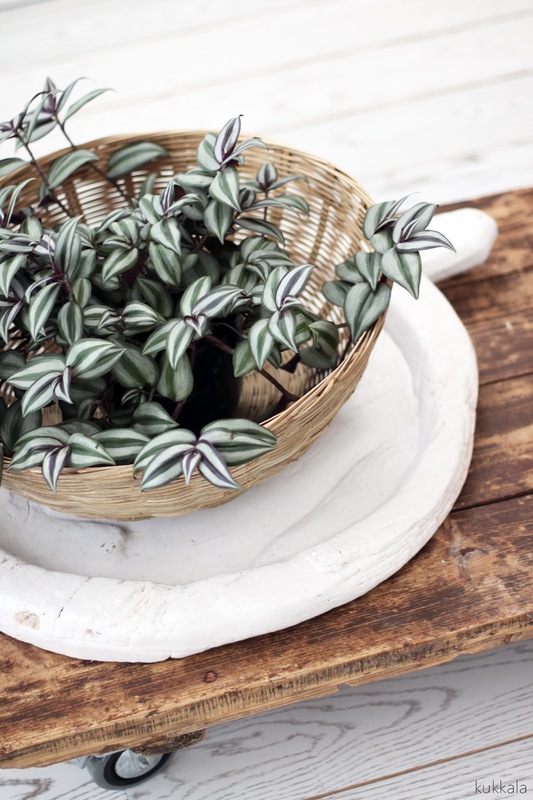 Houseplants have beneficial effects on our living environment and make our lives better, healthier and more beautiful. It is our mission here on Urban Jungle Bloggers to share this love for plants with other like-minded bloggers. 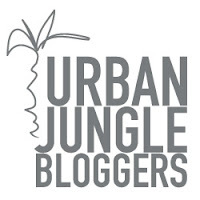 Urban Jungle Bloggers is also about community: a green community that is growing and thriving on the internet and beyond." Ihan uusi juttu minullekin, täytyy niin ikään tutustua. Ja upeat kuvat sulla Sanna! Huikeaa punaista! Hieno toteutus sulta, marsala on niin makee hopeanharmaan kanssa. Thanks Kati! Hauskaa tässä on se, kuinka erilaisia toteutuksia ihmiset tekee samasta aiheesta. Vain mielikuvitus on kliseisesti rajana :) And this was a lot of fun! Aivan ihanat kuvat! Ja kukat!!! 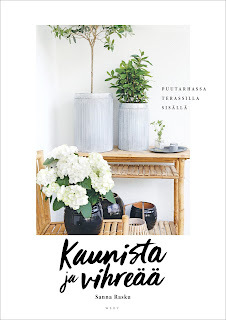 Tosi kauniit. Istutin meidän portaan pieleen callunoita ja siinä oli valmiina pihakäenkaalia, mitä sullakin taisi olla noissa kuvissa? Kaveri kyseli siitä ja etsi muutenkin inspistä parvekkeelle ja annoin sun blogin lisäinspistä varten. ;) Tämä(kin) postaus on varmasti hänellekin hyvin mieluinen. No voi kiitos, kiitos Elisa! Tässä postauksessa ei ollut pihakäenkaalia, mutta kuuluu kyllä ehdottomasti suosikkeihin, ja on vilahdellut blogissakin. Toivottelen kaverisikin tervetulleeksi :) Mukavaa! Minullekin tämä oli ihan uusi juttu. Täytyykin tutkailla asiaa enemmän. Instagram - syys-lokakuu + lehti lähtee..
Kukkala - kuka, missä, miksi?